Here, we will examine two variants of the last animation method we have tried last week. If you have gone through the procedures in creating the sample labels and programs then we can try the same animation method with slightly different settings of the labels. Both labels are placed apart and moved towards each other before they are positioned on the final destination to form the 3D Heading Style. If you think it is better if the distance of both labels are reduced and place them little bit closer so that the animation style have a better appeal then here it is for you to try it. You can implement this variant of the earlier animation style by changing the Properties of the lbl2 label as given below. 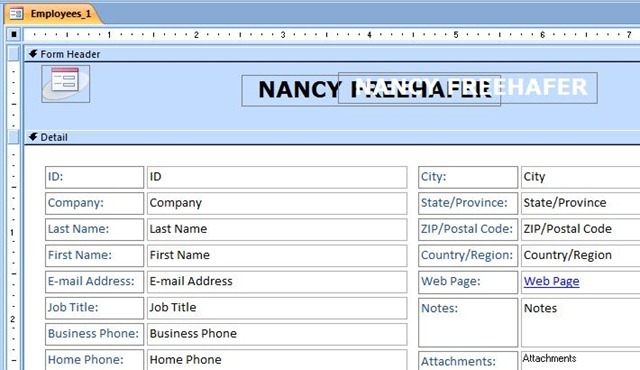 Make a copy of the Employees Form with the earlier animation method and change the Form name something like Employee2_1 or any other name you prefer. Open the Employee2_1 in Design View. Click on lbl2 (the label with White coloured label and display its Property Sheet (View - -> Properties). Once you make the Left Property Value change the label will move into place as shown in the second image above. 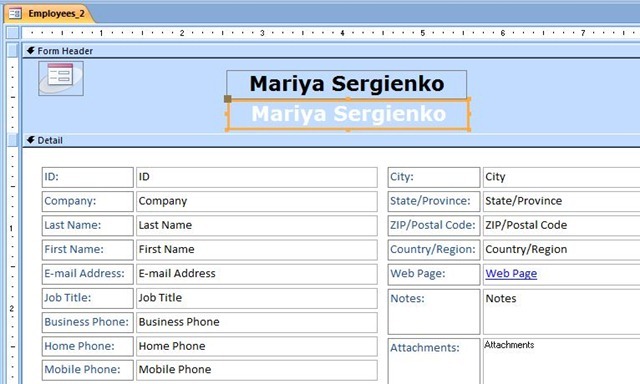 Display the Code Module of the Form (View - -> Code) while the Employee2_1 Form is still in design view. Copy and paste the following modified Code into the Form Module over-writing the existing VBA Code. Save the Form and open it in Normal View. Move the Employee Records forward using the record navigation buttons and watch the refined animation of employee names. I hope you like the over all impact of the change in the earlier animation method. In this method we place lbl2 named label below lbl1 and slowly move them towards each other and place them in such a way that they form into a 3D header. 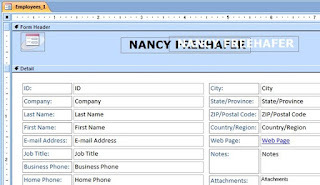 Make a Copy of the Employee2_1 Form and save it with the name Employee2_2. Click on the label with the White coloured text (with the Name Property Value lbl2) to select it. Display the Code Module of the Form (View- ->Code). Copy and Paste the following Code into the Form VBA Module over-writing the existing Code. Try moving the Employee records forward and watch the new method of the same style of animation. Next week we will learn a different and interesting style of label animation method.